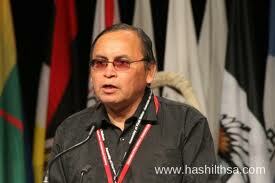 Terrance Nelson during his speech seeking election as national chief of AFN, June 2012. The federal government didn’t have to go far to find out what First Nations leaders were planning during last winter’s Idle No More movement. The plans were sent directly to the government inbox. Terrance Nelson, the former chief for Roseau River First Nation in Manitoba, forwarded private emails to the Department of Aboriginal Affairs – meant as “a warning to Canada not to get stupid,” he told Global News in an interview. The group of five emails, all forwarded on Dec. 30, 2012 and released recently to Global under Access to Information law, contain suggested strategies from some of the most outspoken voices of the Idle No More movement. No responses from the department were included in the released documents. “We have the power to shut down the economy, including the export economies into the U.S.,” he wrote. 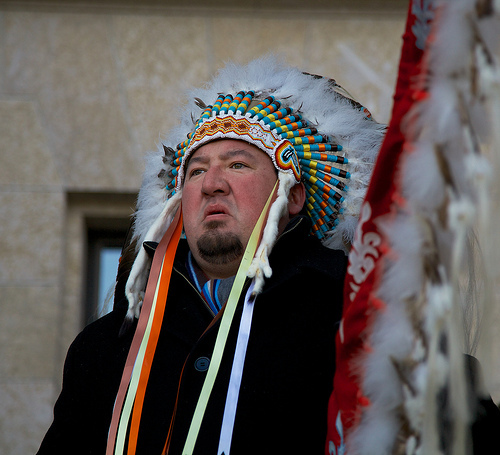 “Grand Chief” Derek Nepinak of the Assembly of Manitoba Chiefs, Idle No More Rally in Winnipeg, Dec. 10, 2012. He also wrote about some of the potential consequences of the “Harper Regime” – including First Nations jeopardizing major energy projects such as the Keystone XL, the Northern Gateway pipeline, and hydro exports from Manitoba. Nepinak has been one of the most outspoken critics of the current aboriginal leadership and Assembly of First Nations National Chief Shawn Atleo. He boycotted the Jan. 11 meeting with Prime Minister Stephen Harper and recently proposed a National Treaty Alliance as an alternative to the AFN’s own treaty discussions before a follow-up meeting with the prime minister. In an interview, Nepinak said he didn’t know Nelson had forwarded his messages. He said he sent them in “a very heightened emotional state of mind,” with many chiefs concerned about the health of Attawapiskat Chief Theresa Spence, who was on a liquid hunger strike since Dec. 11. “There was a lot of really difficult kinds of feelings, a lot of hurt feelings and emotion that was folded into the discussions at that time,” he said. He added his comments about being “pre-emptive” weren’t inciting violence but referred to giving the U.S. a head’s up about potential disruption caused by the protests. “My effort has always been to ensure that there is no violence, but to raise the profile of the issues and the concerns and to raise the economic issues that are at stake here,” he said. The emails also contain messages from Isadore Day, chief of the Serpent River First Nation in Ontario, and Ann Gladue-Buffalo, then-chief of Alberta’s Confederacy of Treaty Six Nations. Neither responded or returned calls for interview requests. Gladue-Buffalo’s email contains details about plans for a National Day of Action on Jan. 16 . “It was agreed that in the short-term immediate pressure needs to be stepped up because Chief Spence’s health is at risk,” she wrote. The note suggested regional coordination and a public relations strategy that extended to international contacts. It also points to ways in which chiefs were attempting to put pressure on the prime minister to meet with Spence. It includes a list of critical dates and strategies to support Spence or protest federal legislation. In an interview, Nelson admitted to forwarding all the emails, except the one from Gladue-Buffalo. A spokeswoman for aboriginal affairs later confirmed he had sent all the emails. Nelson said he is regularly in touch with the aboriginal affairs department. “We just provided a warning to Canada not to get stupid and that’s one of the reasons we provide this information to Canada, making sure that they know that we know,” he said. Nelson added that it’s “somewhat naive” for First Nations people to think the government doesn’t already know about their activities. Posted on April 19, 2013, in Uncategorized and tagged #IdleNoMore, Idle No More, native protests, Terrance Nelson. Bookmark the permalink. 3 Comments. In our area, in British Columbia, the Indian Affairs of Canada allowed the treaty society to become a monster corporation, and still providing $millions to them, the treaty society was only supposed to become a negotiating team, to make things better for our indian communities, in Gitxsan Natiion. Today, there is a bitter division amongst our people, more like a civic war, our aboriginal system is shattered, few handful of wing chiefs and head chiefs are getting $millions a year since 1997, and there has been no treaty, and the $millions does not reach the communities. The B.C. Treaty Commission who dishes out the money to these treaty society group, does not listen to the 95% of the people in villages. Only the few are getting richer and richer, and the Federal and Provincial government is allowing this. Whenever a mining company, a fracking company comes in our area, the Federal and Provincial government knows who to send them to so that they can sign agreements with them. These mining and fracking companies are the main destroyers of the land, worse than Enbridge as there are many of them. The wild game are dying, sickly, and soon, our streams and fresh waters will be so contaminated, where will our people,some 30,000 or so will go. To the cities? They will not have enough income to rent a $1200/mo. apartment, and a one bedroom that will accommodate some 10 or so family members. Utilities are expensive, costs about $300/mo. in cities. The cost of food is ever on the rise, a smail family will spend $500.00 on groceries, as there will be no wild game to depend on, and the salmon will be destroyed.